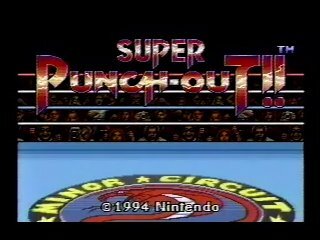 ﻿ Speed Demos Archive - Super Punch-Out!! Super Punch-Out!! was released for the SNES in the United States on February 28, 1994. As a new contender, you slug your way through the grueling and sweat-pounding matches of the Minor, Major, and World Circuits. Dodge bone-bruising punches and dance to the top of the supreme Special Circuit. Face off against old favorites including Bald Bull, Mr. Sandman, and Super Macho Man, plus a cast of new and weird challengers. Pound your opponent's face into the mat and win the title of Nintendo's Video Boxing Association Heavyweight Champion! Best time: Single-segment 0:02:43.37 by Zack 'Zallard1' Allard on 2016-04-14. Single-segment: 0:02:43.37 by Zack 'Zallard1' Allard. Bob Charlie 0:00:05.50 2011-02-14 David Heidman Jr. I really want to thank the many people who left encouraging comments in the SPO IL thread which include: DK28, Heidman (HEIDRAGE), sinister1, PJ, VorpalEdge, Hurblat, Mr. K, Kefkamaydie, and KHANanaphone. I also want to give a thanks to Pokey. His incredible segmented run was one of the big reasons I decided to revisit the ILs. He also provided a really nice IL for Piston Hurricane that matches the TAS, thanks! Gabby Jay: This time is pretty simple to get with the punches I throw after he gets dizzy. This allows me to throw my knockdown punch at the correct frame so that he goes down in an optimal time. Bear Hugger: This is a very involved fight for several reasons. In order to dizzy Bear Hugger with the TAS strat, you need to hit all 4 of his gut punches in a very tight frame window, along with a non negotiable frame perfect delayed hit in order to deal more damage, makes him recoil faster and get more super bar in order to use uppercuts one attack faster than normal. If you don't do either of these fast enough, Bear Hugger will simply not get dizzy. In phase 2, there's an uppercut that you need to land that has about a 15-20% chance of landing, which has killed so many great runs on this guy, but thankfully the game was merciful one of the few times I got a TAS par phase 1 and let me land it for the 12.92. Bald Bull: Really, really difficult phase 1. The dizzy using the TAS strat is easily the most stubborn one in the game, because even after hitting the delayed hit (which has to be frame perfect), as well as the other attacks in a fast manner, it's very likely that Bull won't get dizzy in time; it's pretty cruel. Not to mention phases 2 and 3 have a luck based event in each one, but both of them are at least somewhat common (50-60% each I'd say). Mr. Sandman: This is probably my favorite fight in the table because it has no randomness, yet alot of difficulty to it. The first phase isn't too bad, with only 1 delayed attack that you need to execute, but the magic happens during his dizzy. I waste 6 frames compared to the TAS during this knockdown specifically so he attacks faster in phase 2 such that I only need to hold uppercut in order to floor him. If I were to knock him down at 4"98, I'd have to delay exactly 6 frames at the start of phase 2, which adds another frame perfect action into the equation. Phase 3 is where the fight gets hard though. You need to land 3 frame perfect actions in order to match the TAS time. The first 2 I have audio cues for that work pretty reliably, but the last attack I have no cue for, so it was basically a guess. Luckily, this time I guessed correctly. Super Machoman: This fight has a super, super strict opening... so strict that it's frame perfect. You need to land 2 left jabs (the fastest punch in the game) before he starts his second attack, and you have literally no room to screw that up because he starts it immediately after you land your 2nd punch if the first one was frame perfect. The rest of the fight is pretty simple though, with a couple of tricky counters and some bad luck that you need to deal with from time to time (dancing around, exercise programs, blocking, ect). Aran Ryan: This is a pretty simple fight overall. You need to hit 2 things frame perfectly in phase 1, and one super in phase 2. The phase 2 super is really tricky to land, but since this is a really short fight, it isn't too bad. Heike Kagero: Thanks to McHazard's new TAS, KO's on Heike Kagero are possible! You need 2 luck events in phase 2 to get this to work, but once you get it, Heike cannot answer the 10 count; it's pretty great. So, Narcis, he is the most wildly luck based fight in the game by an enormous margin; no other fight in Super Punch Out comes close. Just about every possible moment you throw a punch, or Narcis is idle, there is an opportunity that he will just move out of the way or attempt to counter you, or even just randomly block, and all of these events are more common than him just standing there to take hits! The execution is nothing to scoff at either, as the fight starts with a 2 frame window in order to land all 3 gut punches successfully. Once all 3 have landed, you need to counter his hook and do a frame perfect delayed punch to gather more arrows in your super meter. I ended up figuring out that if you tap left (don't hold) then you get a consistent dodge that is faster than a full dodge. This was pretty strongly hinted at in the TAS, but I assumed it just did a dodge followed by a frame perfect re-centering, but nope, it works fine as a frame perfect buffer strategy in real time too! So once the delayed punch lands, you need to perform another buffer strategy that ensures Narcis gets hit on the first frame that he is vulnerable again when he walks back. Once that punch lands, you need to pause so the super meter can catch up, then you need to do rapid punches on the earliest possible frame that you can punch, which means you need to tap B twice pretty fast. If you are even 1 frame too slow, Narcis will fail to get dizzy, which happened in numerous attempts sadly. Phase 2 is the same as previous Narcis fights, although thanks to akiteru, there is now a buffer for when Narcis steps to the back of the ring, which is pretty handy considering that is a punch you really cannot afford to miss. Once that final uppercut landed and Narcis didn't block/dodge it, the wager with DK28 finally ended and Narcis fell to the mat, defeated. Hoy Quarlow: This guy has some pretty strong luck too, but I can actually finish phase 1 on occasion, unlike some other fight I know of *cough*NARCIS*cough*. There are 6 random things that need to go your way in order for this strategy to succeed, most of which involve him not ducking your attacks or randomly blocking your punches, both of which happen pretty often. One cool thing to note is that his final attack in phase 3 is on a move timer, so you'll notice that my phase 2 is at 7"33 (TAS has 7"30 at this point). Since I was 2 frames late in phase 2, he will attack 2 frames faster in phase 3, which gives me a chance to catch up to the TAS time if I land the last punch frame perfectly, which I thankfully did. Rick Bruiser: Another improvement thanks to McHazard's TAS. He changes up phase 1 to where he gets out a frame faster while Rick still has the same refills as the old strat. This new run cuts that same frame. Nick Bruiser: There's been a weird series of improvements that I've done for this guy. First I got in the mid 9 second range for him, then low 9's and sub 9 with the same strat but tweaked a bit to use faster punches, then I couldn't improve him for the longest time. His uppercuts in phase 2 were ultra rare to land, and I couldn't figure out why... until the night I decided to do this IL; I noticed his phase 2 also acts on a move timer. For the uppercuts to land, I needed him to start an attack to where my first uppercut directly intercepts his such that his move timer is reset. Once I realized this, I immediately switched to the TAS strat and got this IL within an hour. This makes phase 2 trivially simple, but still kind of rare. As for phase 1, the right counter to the face needs to be frame perfect to where he recoils fast (similar to hugger and bull), then you need to do a delayed hit that gets him out of his stun, then land 2 face punches which he sometimes blocks. This is my IL for Piston Hurricane. It matches the TAS time but was very difficult to achieve. I actually achieved the time twice, but the first time I accidentally paused and retired because I thought I had failed. Masked Muscle: Matches the time from the new TAS made by McHazard. 2 frame improvement from the old time of 6"33.